The first steps in flushing a tree or vine crop microirrigation system are to flush the mainlines and then the submains using flush valves, which should have been installed in the system and sized to allow sufficient pipeline flow velocity to wash away contaminants. All filters on the system should also be examined to ensure that they are clean and operating properly. Laterals in permanent crops are in most cases flushed by hand, with several (but usually fewer than 10) lateral line ends opened at a time and allowed to flush clean. Opening only a few lateral lines at once will ensure adequate flow to thoroughly flush the lines. Flushing should initially be done every 2 to 3 weeks. If the lines do not flush clean within a minute or two, more-frequent flushing may be needed. If the lines appear clean when flushed at 2- to 3-week intervals, you may be able to flush less frequently. 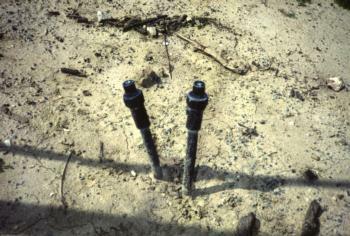 Self-flushing lateral line end caps are also used in microirrigation systems for permanent crops. The end caps are normally open, but they close when the system reaches a certain pressure. This allows a short flushing at the beginning and end of the irrigation. Periodic manual flushing is still recommended in these systems since flushing end caps do not provide a thorough, high-velocity flush. In some instances, self-flushing end caps may not close completely and may leak.